There are two of us. One of us is working hard to pay off University debt (all orders greatly appreciated), and the other is studying Film & Media Production at University in Sheffield. When did the brand start? The brand only started in January, I think, late January on a Friday night in order to make money to pay off the debt from University, so we are still relatively new to this. We had no idea that it would take off as well as it has, we are so thankful for all the support and interest that this has gained so far. Where did the idea stem from for your patchwork clothing? It stemmed from a number of different areas. 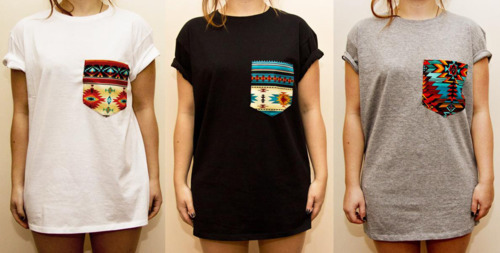 Tantum clothing is obviously a clear inspiration to our shirts, the pocket idea seemed like such an easy concept but they charge (in my opinion) far to much for a shirt, you're talking fifty quid, its mad. Normal kids can't afford that. Besides inspiration from major clothing lines, we saw pocket shirts in a number of stores around Manchester and Sheffield, but they were poorly stocked and still, what we thought, were asking to much per shirt so I guess we thought we could do it better, and cheaper. We wanted to create a low cost alt option which we think we have achieved. You currently do t-shirts on your website, are you hoping to branch out to other items? We've thought about it, and yeah it'd be awesome to expand but right now we're still just focusing on the shirts, especially with summer around the corner. We definitely want to keep it just as clothing at the moment, maybe expanding into oxford style shirts, crewnecks and hoodys. We're still testing the water so it'd be a couple of months before we consider dropping a new item. How popular is the brand at the moment? Its pretty mad. We never expected the reaction that we've received. The shirts have gone pretty much worldwide, we're consistently getting emails asking us if we ship to new destinations, so we add it, and ship the shirts and we're just expanding and expanding. Its ever growing, especially with something like Tumblr, the images of our shirts are just forever circulating. I guess with blogging and social networking, theres no way it would be as wide spread as it is. How have you got the word out there about what you do? Blogging, Tumblr, Forums and word of mouth really. Like I said, they just keep doing there rounds on Tumblr so the brand is advertising itself really, its cool because its like our customers are targeting new customers in ways that we couldn't reach personally. Is your website the only place we can purchase your patchwork t-shirts? Yeah, currently anyway. We've had talks with a few small shops in Sheffield, and it'd be awesome to expand onto the street. It's hard though, as we currently are only making them to order, shops obviously want a higher demand and we don't want to agree to something that we couldn't keep up with. Do you do custom patterns/take any ideas from your followers? No not currently, but its a cool idea, but again because we're such a small new brand we don't want to take on more than we can handle. We've had a few messages about custom designs but its difficult because if everyone wanted one, theres no way we could sort it out. We definitely will look into it though. Where do you hope to take Patchwork Apparel in the future? Worldwide? I don't know really, anywhere and everywhere. We've been offered a few crossover deals with a couple of other small clothing brands but nothing is set in stone as of yet. Right now, it seems it can only grow, and thats down to everyone who's ordered a shirt so thank you. Keep checking us out, we couldn't do it without the support. Check out our webstore here. And if anyone has any queries, send us an email and we'll get back to you as soon as possible.